Tap dancers show their skill through their routine and the sounds they make while performing. These sounds are made from the taps on the bottom of their shoes. Tap shoes are also known as “two shoes and four taps” because the shoes have a tapper on the toe and one on the heel. When picking out tap shoes, the sound that they make is just as important as the fit and look. 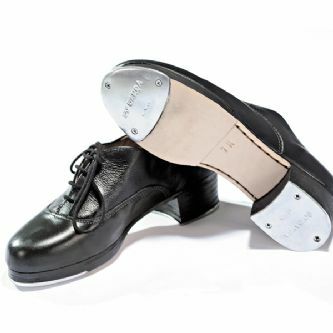 Tap shoes are normally made from leather, canvas, or plastic. Most men like to wear shoes known as black-tie oxfords. Women like two-tone spectators, oxfords and Mary Janes. Black patent leather is one of the popular choices, but there are a variety of different colors available. The soles are made of leather or suede. The soles can be full or split which adds more flexibility. The heel of the shoe is normally one or more inches high. Tap shoes can normally cost between $40 and $100. Taps are put onto the shoes with screws. There are three main types of taps. They are TeleTone, DuoTone and Supertone. The TeleTone taps are the most popular. These are attached with three screws. There are a few ways to attach taps to shoes. You can put them on yourself, have them put on at a shoe shop or just buy shoes with them already on. You can loosen or tighten the screws on the shoes to adjust the sound. For new tap dancers, it is best to always buy your new pair of shoes in person. When going to buy shoes, wear the stockings or socks you will be wearing when you dance. Also bring any other inserts or innersoles you might need when wearing the shoes. You want your shoes to be comfortable and snug, but not too tight. If you are going to be doing “toe stands”, then ask for reinforced toe boxes to help support your feet. Once you have narrowed it down to a few pairs, try dancing a little in them to see how they feel.